Artists Craig Dongoski and John Roach propose a series of events on the island of Kefalonia that explore its environment, culture and history. The project, which would run from July 22nd 2015 to August 12th 2015, is structured around the three words that make up its title: Siren Earthquake Radio. Each of these ideas suggest an energy or signal that will frame our engagement and our understanding of the forces that make up Kefalonia’s history. 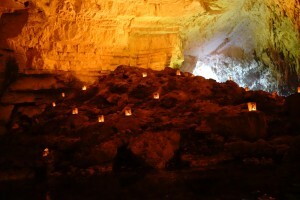 The project includes four main activities: a fluid participatory event in the Melassani Cave; a performance at the Ionion Center which will bring these two U.S. artists together with local Kefalonian artists, musicians and poets; a series of radio broadcasts that present the daily and evolving work produced during the project; and a schedule of workshops and events in which the artists work with the people of Kefalonia. Dongoski and Roach will respond to their experiences, observations and impressions of the cave. The movement of boats through the cave’s watery enclosure will serve as the physical and metaphorical material for a performance and sound installation. The goal is to augment the tour of the cave through sonic interventions. This begins with the understanding that visitors travel and experience the cave visually as a loop. This continuous and predictable path of the boat is a circuit interlaced with small hesitations and deviations. The boats travelling this circuit will become the shifting components of a system of feedback loops, unexpected sonic collisions, music and light. The flow of visitors will dictate the structure of this performance-intervention and will necessitate our access to and cooperation with the authorities who manage the tour schedule. On the other hand, a discrete performance using the cave as an amphitheater is of equal interest and enables other possibilities. We could engage Melassani as a controlled performance venue in addition to, or in place of the aforementioned visitor-dependant proposal. Dongoski and Roach will design an event for a live audience at the Ionion Center. While the shape of the performance will be determined during the residency, the goal is to work with local artists which might include musicians, dancers, poets, etc. Of particular interest is the language and music of the island, which the artists will meld with their own revelations that arise during their explorations in Kefalonia. An initial starting point is to use the wind as source material. To this end we would like to begin a conversation with authorities that might grant us access to document wind turbines and allow us to temporarily install wind harps for collecting sound. We also want to put the geological reality of earthquakes (eg seismic activity) in the foreground of at least one of our performance pieces. Access to a facility that possesses a seismograph is of great interest for the artists and would connect the geology of the island to drawing and graphic notation. The artists will be in constant dialogue with Kefalonia as a place: its weather, its goats, its land, its water; and will be recording and experimenting throughout their stay. Each day Dongoski and Roach will create a mix from the material accumulated so that it can be shared over the airwaves. While many of our projects incorporate collaboration with the people of Kefalonia, we would like to encourage direct and organized participation through workshops the results of which can feed back into our work. One example is an instrument building workshop for children followed by an improvisation session. Another is a Greek language pronunciation workshop in which the two artists work with local participants to attempt to enunciate words in Greek.